IO-W Wallplate / Desktop Mount with IO Quick-Change Coupler. 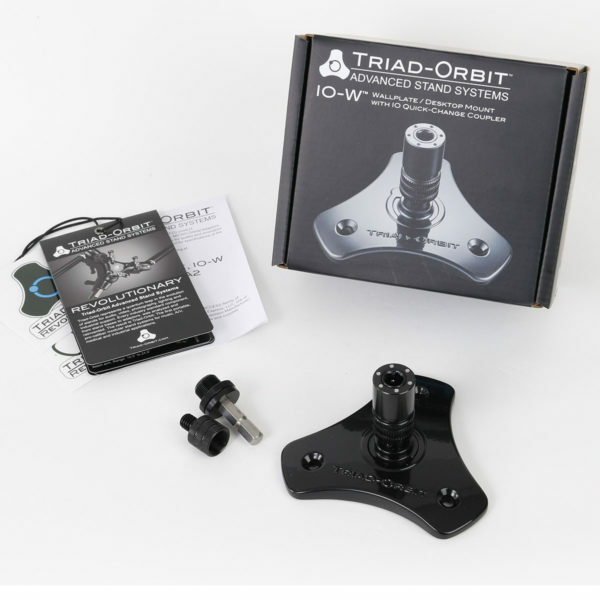 IO-W Wallplate provides a stable platform for mounting Triad‑Orbit IO‑equipped microphone adaptors, boom arms, tablet holders and assorted accessories to flat surfaces including walls, ceilings and desktops. NOTE: Screws are not included with the IO-W, but we recommend using either #14 wood screws and/or 1/4-20 machine screws with a countersunk head. Length should be determined by the mounting surface material and anticipated use. If unsure of properly wall or ceiling mounting the IO-W, please refer to a qualified contractor to ensure mounting method and hardware is appropriate for the desired use and load. Only insert hex adapters that are steel and have a safety notch into a ceiling mounted IO-W. Do not insert the following IO heads into the IO-W: IO-H1, IO-H3, and IO-H4.